From a bluff high above the Missouri River I could see the Lewis and Clark Expedition campsite of May 30, 1805 near Pablo Island. In the opposite direction I could see many of the spectacular rock formations that the explorers would view the next day because I had just experienced them myself. I was one of fifteen paddlers in a 34’ foot long canoe – the same dimensions as the dugout canoes used by Lewis and Clark. In the evening our campsite near Dark Butte was spectacularly beautiful, a fitting end to a glorious day following the river trail of the Corps of Discovery. We saw Stonewall Creek, the Grand Natural Wall, and Citadel Rock, all identified in the journals of Lewis and Clark. 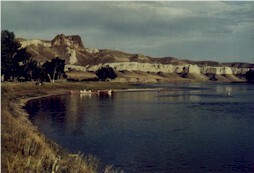 We also viewed landmarks undocumented by the journals of Lewis and Clark, but undoubtedly noticed by them: La Barge Rock, Eye of the Needle, Hole in the Wall, Eagle Rock, the Grand Tableau, Steamboat Rock, and, of course, Dark Butte. Lewis writes about the beauty of the place: "The hills and river Clifts which we passed today exhibit a most romantic appearance."